Tumeron’s Curcumall contains a complex of three different curcuminoids called “C3 Complex” which increases turmeric’s potency from under 5% curcuminoids in turmeric spice, to over 95%, as found in Curcumall. Ginger is added to increase the bioavailablity of the turmeric complex. Ingredients: Glycerin, Alcohol (30% of total product), Turmeric (Curcuma Longa), Curcumin C3 complex (minimum of 95% curcuminoids), Ginger extract (Zingiber Officinale), Lemon Verbena extract (Aloysia Citrodora), Water. Recommended Dosage: 1 tsp (5ml) in a glass of water 2-3 times daily, at least half an hour before meals or at least 2 hours after meals (i.e. on an empty stomach). 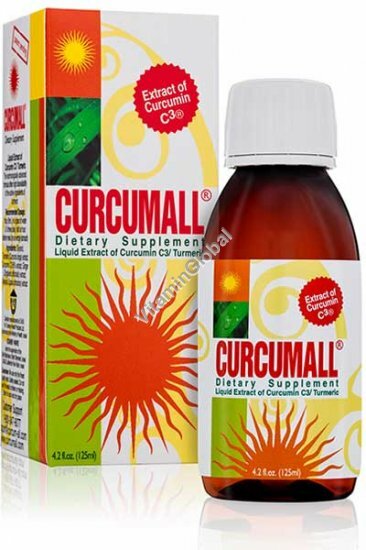 IMPORTANT NOTE: Due to natural variations in curcumin batches, Curcumall's taste, aroma, and color can vary significantly from bottle to bottle. However, the potency remains consistent.